This article is about the town in Eastern Cape. For other uses, see Middelburg (disambiguation). Middelburg is a town in the Eastern Cape province of South Africa, in the Great Karoo. It lies in the Upper Karoo, 1 279 m above sea level, with a population of 19,000. It falls under the Inxuba Yethemba Local Municipality, in the Chris Hani District Municipality. The town and surrounding areas are rich in history from the Anglo Boer War. The adjacent Grootfontein College of Agriculture was originally established as a military camp and training centre for British troops. About 7 000 troops from the Third Manchester Regiment were stationed at Grootfontein - some of them were married, so about 3 000 women and children also lived at Grootfontein. In 1910 the Union of South Africa took control of the farm after which the Grootfontein School of Agriculture was established in 1911. Today the college offers a two-year Certificate in Agriculture and a three-year Diploma in Agriculture, both accredited by the Higher Education Quality Committee. The R56, the shortest route between the Northern Cape and KwaZulu-Natal begins at Middelburg. The town's hospital is Wilhelm Stahl Provincial Hospital. Jozua François Naudé, Pator in the Dutch Reformed Church, was born in Middelburg EC in 1873. Middelburg is also the birthplace of playwright Athol Fugard. Other well known South Africans who were born or lived in Middelburg include Eddie Stuart (Footballer), Steven Sykes (Rugby player), Keanu Vers. (Rugby Player), Arthur Lennox Ochse (Cricketer), John James Clements (recipient of the Victoria Cross), Eric Rosenthal (historian and author), Cecily Norden (Horse industry), John Phillip Harison Acocks (botanist), Vuyani Simama(Radio presenter-EdenFm), Colin Turpin, Reader in Law at Clare College, Cambridge. 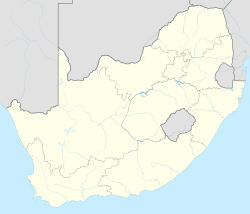 ^ "Climate Statistics for Middelburg, Eastern Cape, South Africa". Retrieved June 8, 2012. 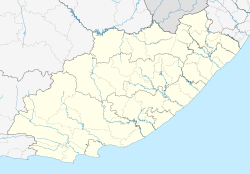 Wikimedia Commons has media related to Middelburg, Eastern Cape.